ORANGE, NJ – September 27, 2018 – Long time neighbors on Central Place gather to witness the demolition of “Aunt Kate’s house” at 176, as part of the ongoing revitalization of the area by the Housing Authority of the City of Orange and the Orange Housing Development Corporation. Both 176 and 183 Central Place will be pulled down to make way for new, single family houses for workforce residents. They are part of the planned small house project designed to maximize space on small plots of land. Maurice Brown, P.E, from C2EM Urban, LLC, the consulting engineers for the project, was on hand to observe. “This is Dr. McNeil’s vision for a wholesome, residential community in Orange,” he remarked. 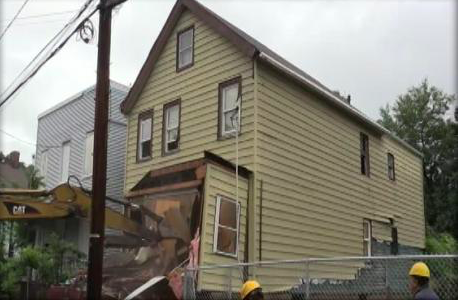 The demolition of the two houses is part of the HACO and OHDC’s ambitious plans to redevelop the area that has been plagued with crime and filled with vacant, abandoned properties. “This is just two properties that we have been dealing with to make the neighborhood safe and secure,” said Felicia Dominguez-Santos, OHDC’s development manager. While those new opportunities are bringing hope to an area that has declined through the years, there was a sense of poignancy at the changes. Residents remembered Aunt Kate who had no children of her own, but would take care of those in the neighborhood. They spoke of block parties and riding their bikes up and down the street, activities that may soon come again. The City of Orange Housing Authority works to transform the City of Orange by providing safe, livable and affordable housing that promotes the development of communities. At the Orange Housing Authority, participants are not statistics, they are neighbors. The OHA knows the community and tailors programs to better serve the participant’s needs. Whether it is a search for housing, assistance with foreclosure or neighborhood development, the Orange Housing Authority stands ready to offer its services to all residents.